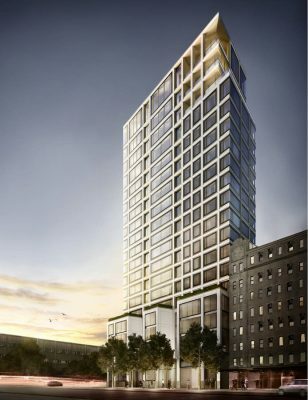 Scott Resnick has announced Foster + Partners as design architect of 551 West 21st Street – a new, 19-story luxury condominium overlooking the Hudson River in West Chelsea. 551 West 21st Street features 44 large-scale residences, including three penthouses. Beyer Blinder Belle is the executive architect. GTIS Partners is the financial partner and Wells Fargo is the construction lender. Construction of the building is under way with anticipated occupancy in the fall of 2015. 19 STORIES. 44 EXCEPTIONAL RESIDENCES. Designed by the master architects of Foster + Partners, 551 West 21st Street of fers an urbane setting in downtown Manhattan’s most exclusive neighborhood for art and architecture. Suffused with light, space and thoughtful materiality, the majority of 3-5 bedroom residences provide multiple exposures, private elevator access and up to 11-foot ceiling heights. Foster + Par tner’s interior design is largely column-free, featuring layouts with dedicated foyers, grand galleries, corner great rooms, windowed eat-in kitchens, separate libraries and dining rooms. Finishes include custom millwork and kitchens designed by Foster + Partners for Molteni. Three full-floor 6,200+ square foot Penthouses present majestic 360-degree views, up to 12-foot ceilings, wood-burning fireplaces, dramatic loggias and terraces and superlatively scaled spaces for modern living and entertaining. of the location’s coveted southwestern light. With a private drive court, the building will provide residents discreet full-size living in the heart of this culturally rich neighborhood. The immediate location is home to the High Line and Hudson River Parks, Chelsea Piers, the muchcelebrated Avenues: The World School and worldrenowned galleries, architecture and restaurants. With an ease of access to surrounding neighborhoods and their cultural landmarks including the new Whitney Museum and the Dia Art Foundation, as well as the Chelsea Piers and SuperPier, West Chelsea is among the most vibrant and sought after neighborhoods in the world. 551 West 21st Street’s robust, cast-concrete exterior frames expansive windows with warm metal surrounds that enhance the location’s abundant western light. The building’s two-to-five bedroom residences (up to 6,400 square feet) feature 11-foot ceiling heights and multiple exposures – most with private elevator access. Foster + Partners’ interior design features grand galleries, many with corner great rooms, windowed eat-in kitchens and separate dining rooms. The highest levels of craftsmanship and finishing are reflected in French-inspired herringbone floors and custom millwork and kitchens designed by Foster + Partners for Molteni. The three penthouses offer unobstructed 360-degree views, 12-foot ceilings, wood-burning double-sided fireplaces, adjacent club rooms and libraries, and large private terraces or loggias. The upper-most penthouse includes a full rooftop terrace with a swimming pool. Residences for guests and staff will also be available. 551 West 21st Street’s level of services and amenities merge with West Chelsea’s art galleries, restaurants, the High Line and Chelsea Piers to bring a new downtown living experience: the building’s discreet, private-drive court leads residents and guests to a cathedral-like 34’ high lobby illuminated by natural sunlight flowing through a prismatic glass wall – creating a true sense of privacy and security for residents and their guests. Mechanical areas have been raised to the second floor and concealed flood-preventing gates will protect the building in the event of a future storm surge. Signature white-glove services will include a 24-hour doorman, porter, concierge, and valet parking. The building’s amenities also consist of state-of-the-art fitness center, spa, residents’ lounge, and a children’s play area. 551 West 21st Street will also be the new home of 303 Gallery, which will occupy the western portion of the first two floors and have a separate entrance. Residential sales will begin October 2013 and will be offered exclusively through Brown Harris Stevens Development Marketing. GTIS Partners, the New York-based global real estate investment firm, will act as investment partner. Wells Fargo will lead a consortium of four major banks as lenders. Brown Harris Stevens Development Marketing specializes in the planning, marketing and sale of best-in-class residential developments and conversions. Brown Harris Stevens, established in 1873, is the premier provider of residential real estate services in Manhattan. The firm has offices throughout New York City, The Hamptons, North Fork and Palm Beach. Brown Harris Stevens offers more luxury residential exclusives than any other Manhattan firm, and serves as exclusive affiliate of Christie’s International Real Estate, Inc., a subsidiary of Christie’s International PLC, the world’s oldest fine arts auctioneer.